Yea! I'm in the July issue of Somerset Studio magazine. I just got my copy and love it! 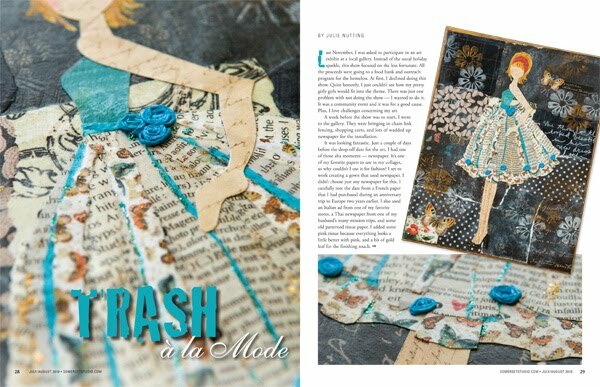 I have an article featuring fashion art made of trash. I used lots of newspaper for these 3 pieces. I had papers from Montrreal, France, Italy and Thailand. I so hope there's nothing bad written in these languages because the girls and their dresses are so cute! hooray! i can't wait to pick up my issue! i just adore the close up shots! it looks amazing and I love the colors. congrats. what a great magazine. i will def. pick up the current copy and look for you. wow. so great! I'm so glad for you! I can't wait to see it! Congrats, your work is so gorgeous!!! I fell in love with your art in this magazine and I'm working on making the one you give instructions for. I have learned that gold leafing is pretty tricky to work with! Gold leafing is tricky to work with! Not one for instructions, I just wet the area with glue and put a piece on my finger and just rub it on. The piece breaks up into millions of little specks that look like pixie dust!